With any luck, for you and for me, this is the last blog post I will ever write about my child’s potty habits! There are some things I’ll miss about the first three years of G’s life, but changing and washing diapers, and washing the poop out of his little potties, is not one of them! Just to recap, G has been waking-time diaper free for well over a year now (since right around 22 months). For a few weeks last August, I thought we might be nearing the nighttime dry point, but it was not to be. I finally figured out that most of our problems with nighttime cloth diapering were due to diapers that were too small. I hemmed and hawed over buying bigger cloth diapers or cloth nighttime training pants while I ate through my reserve of disposable diapers (that were supposed to be for travel or GI issues only), wondering if I would invest in something only to have him start staying dry at night. 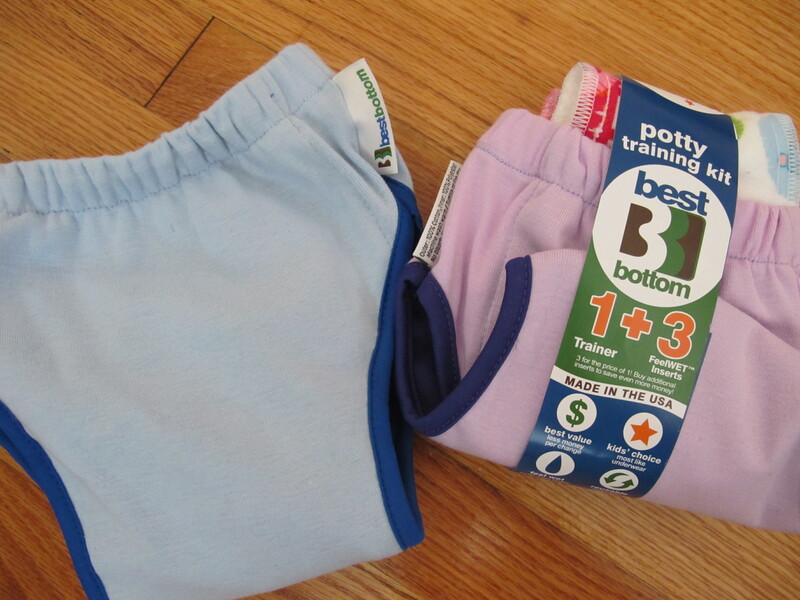 At the end of May, I finally bit the bullet, and ordered two types of overnight training pants, the Flip [One-size] Training Pant and the Best Bottoms Potty Training Kit. When Matthew and Gabriel returned from Florida, Matthew reported that G had woken with a dry diaper on about half of the nights. Two days later, these arrived. At that point, I started making a concerted effort on the liquid intake and output fronts in the hour-ish leading up to bedtime. Instead of just offering the potty right before bed, we started encouraging him to try 30-45 minutes before bedtime, and then again one last time. I focus on keeping him well hydrated up to and through dinner (about 80 minutes before bedtime), but then really limiting drinks after dinner — usually just a small sip of [unsweetened soy] milk and a small sip of water right before bed. Unfortunately, those training pants I bought don’t do the trick for larger amounts of liquid output. The Best Bottoms don’t fit tightly enough at the legs to prevent leaks (though the XL size fits him well otherwise). 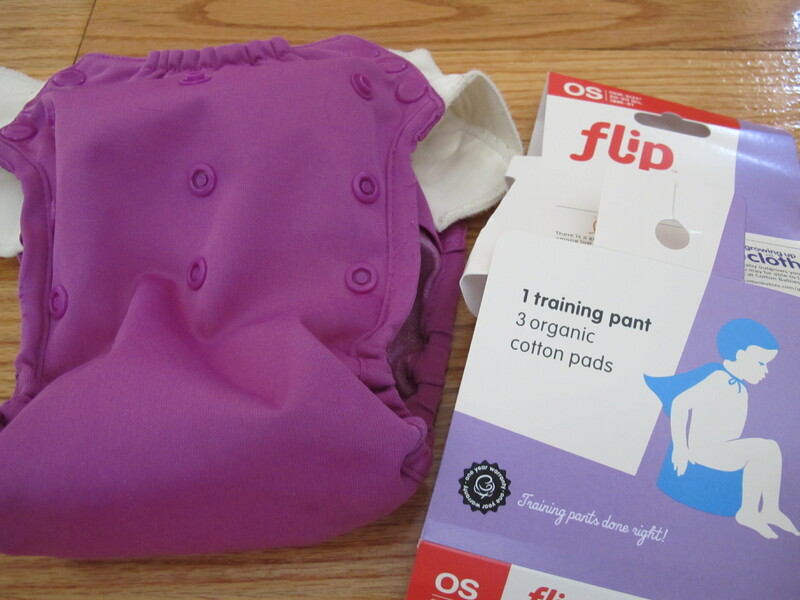 The Flip fits pretty snugly, but the included inserts just aren’t particularly absorbent (note: I’m lazy and have yet to follow their “maximum absorbency” washing instructions), though it does work for little leaks. Since he’s staying dry over 90% of the time, we gamble on using the Flip training pants most nights. If our schedule has been slightly funky, or there’s some other reason I think he’s less likely to stay dry on a given night, I’ll go ahead and use a disposable, because changing sheets in the middle of the night is no fun. We’ve used the same disposable diaper on five or six different nights now — even though it’s stayed 100% dry, it’s showing signs of wear and might be retired soon. In general, it’s great that he’s pooping in a potty, and pooping regularly, but a bowel movement that I have to rinse and wipe out of a training potty is a lot messier than one I can just flush, so a couple of months ago we started encouraging him to try to poop on the big potty, going to far as to offer him a treat. * Many times he refused to try. Other times, he would try on the big potty with no success and move back to the little potty. And then last week it finally happened — poop in the big potty, twice in a row! Since then, he’s gone back and forth between locations, but this is definite progress. *As a rule, I don’t like using food as a reward/bribe because of the risk of creating an unhealthy relationship with food, but I have made a few exceptions in the potty training process. We used raisins as a treat for peeing in the [little] potty early on. For this round, we’ve been offering a small cookie or a few chocolate chips. The treat is coupled with lots of verbal praise and reinforcement, and, with the raisins, we phased them out pretty quickly once he mastered the behavior. This entry was posted in Green Ideas and tagged parenting. Bookmark the permalink.